This week, The Economist cover shouts, “Africa Rising: After decades of slow growth, Africa has a real chance to follow in the footsteps of Asia.” As it points out, this past decade, six of the 10 fastest-growing economies were African, and the IMF expects African growth to chug forward at a rate of about 6% this year and next. It’s great to put a spotlight on the fact that Africa is not perpetually mired in stagnation and misery. There’s good reason to be hopeful, and while American investors are always slow to the party when it comes to Africa, in a world with few good investment options, maybe some greenbacks will flow to the continent. As a political scientist, the obvious question I wanted to ask was, what are the sources of variation in growth, and what are the political factors influencing those patterns? Obviously in a few cases, most of the story is natural resources – Angola and Equatorial Guinea. But is the quality of democratic politics any predictor of growth outcomes? 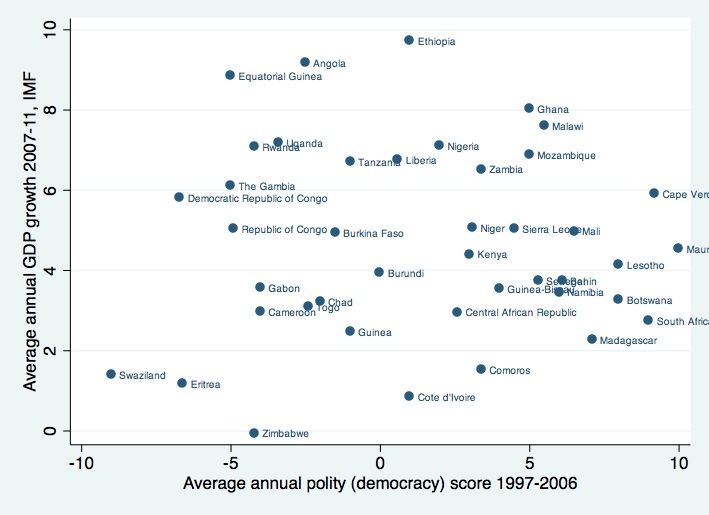 I did a quick analysis: I calculated the average 10-year polity scores (which is a measure of regime type, ranging from -10 – hereditary monarchy to +10 – consolidated democracy) for the period 1997-2006. Then, I plotted the IMF average annual economic growth figures on the Y-axis for the period 2007-11. All sorts of caveats apply – for all of the countries, 2011 is a forecast, and for some countries, other years in the series are projections as well, and of course, the quality of data are pretty mixed. But are recent patterns of economic growth in any way predicted by prior patterns of democratic politics? It doesn’t look that way… there’s no real pattern in the data. Obviously, this is just a straight-up scatterplot and there’s lots of interesting ways one could do this analysis more seriously. In the lower left corner, the tragedies of Swaziland and Zimbabwe are clear, but several other pretty autocratic countries are doing just fine in terms of economic growth. Meanwhile, the Southern African democracies of South Africa and Botswana are advancing at a more lackluster pace, albeit from a much higher level of development than almost all the rest of Africa. Ghana is a real stand-out on the positive side, having enjoyed successful leadership replacement and high economic growth. But in sum, there is no clear pattern at the country-level. African successes and failures are emerging in a wide range of manifestations. I enjoyed this site very much. I couldn’t have spoken it better.